I would like to share with you guys this awesome guide just recently made by a reddit user called Undoer (link to his reddit profile HERE). Its 34 pages full of information to help new players understand what their class can and can't do, how it plays, what flavour or mechanics are unique to that class, and what roles it can perform in, and also what roles it can easily access groups in. I saw that guide on Reddit! Won't need it though, but good to have. Nice looking thread man, cool design. Great work again Syturio, I'll be using this to help me make a decision. Is the guide authored by you? I saw this guide on reddit, it's great! Thanks for sharing it here. I also love the design of your thread, very cool! This is dope. Thank you for sharing! 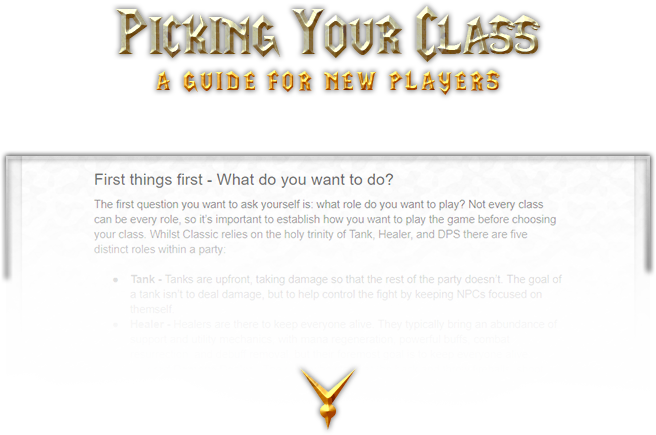 This is probably the most comprehensive guide for helping new players select a class. Thank you for sharing this, I'll definitely forward this to any new players I manage to coax into playing Classic WoW! Thanks for this guide, taught me a bunch of information to help me try to decide! Find your Vanilla Friends (new and improved website)!